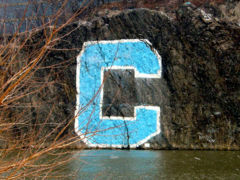 The Columbia "C" generally refers to the giant painted letter "C" on a 100 foot high wall of Fordham Gneiss on the Bronx shore of the Harlem River opposite from Columbia's Baker Athletic Complex. In 1952, Columbia medical student and coxswain of the heavyweight crew team Robert Prendergrast approached the New York Central Railroad for permission to paint the sign, which was granted. The crew team completed the 60 ft by 60 ft sign in traffic white and ultramarine blue with a 12 ft stroke by the fall of '52. Work was aided by a boatswains chair attached to drillholes at the top of the rock by ropes. The sign is maintained by members of the crew team, who repainted the sign in 1987. The letter 'C' is also used as an athletics-related logo in a number of ways. These include an eight-sided octagonal C similar to the one seen one painted on the rock, the "Split C" (a mark reserved for use by Club Sports who aren't allowed to use the logos of the Intercollegiate teams), an interlocking "CU" logo (seen mostly on bookstore merchandise these days), and the "Block C" (featured on football helmets since 2006). The "Block C", seen most frequently on football team helmets. Actual current design seems to have a slightly stronger drop shadow. ↑ Gneiss is a stone native to the Bronx, whereas most of Manhattan is composed of Schist. As the saying goes, "The Bronx is nice, but Manhattan is Schist" (or "the Schist," depending on one's perspective). This page was last modified on 18 April 2013, at 01:31.